I cannot gush over this book enough. This book has been a part of our collection for years and we still use it so frequently that I don’t even bother putting it back on the bookshelf each night. It’s become a near permanent fixture of our kitchen counter. This book makes the stories of the Bible accessible and understandable to even the youngest children while still challenging and engaging older kids as well. You want to know the best thing about this book? The author found a way to simplify the Biblical stories without “dumbing them down” one bit. This is why I frequently recommend this book to the women I teach Bible study to as well. It clearly points readers to the the big picture behind the stories, characters, and events of the Bible. This book has helped me make God’s Word a part of everyday life for my younger children. This is the Bible we bought for our oldest when he became a proficient reader. The NIrV (New International Reader’s Version) translation is especially crafted for younger readers or for non-native English speakers. It is based on the New International Version of the Bible, but is even easier to read and understand. It contains simpler words, shorter sentences, and offers explanations where needed. I love, love, love the “storybook” Bibles. However, as soon as a child is literate enough to be in an actual Bible, I want them in an actual Bible. One of the things I discuss in my book, His Word Alone, is how the only way to grow more familiar with the Bible is to actually get in your Bible. I want my 9 year old son to clumsily flip through it’s pages. I want him to use the table of contents to look up page numbers. I want him to learn which books are Old Testament and which books are New Testament. The only only way he is going to learn these things is by spending time in an actual Bible. In addition to teaching my kids how to read the Bible, I want to teach them how to study and understand the Bible. This is where the My Bible Reading Journal comes in. I got this idea from a free download offered at http://thepelsers.com/printables/. The basic idea of the journal is that as your child reads the Bible, he or she does a simple study of it as well. For every chapter or section my son reads, he has to do 1 of 4 things in his journal. 1) Write down one thing he learned. 2) Write down a question he has about what he read. 3) Copy a verse out of the day’s reading. 4) Write down something or someone he is praying for. But what this simple study method does is teach your child to engage Scripture. It teaches them that they can actually interact with the text. This is a life-long Bible study lesson that we all need to learn. Bible study is not about words on a page. It is about the God behind the words. When my son asks questions of the Bible, he is actually asking God a question. When he copies a verse, he is meditating on God’s truth. When he reads the Bible he is learning how to listen to the God who speaks to us through it’s pages. This is the newest addition to our kids’ bookshelf. The Ology is a beginners book of systematic theology in the form of a beautifully illustrated storybook. I bought this book for my kids, yes, but in all honesty, I bought it for me, too. Systematic theology organizes the teaching of the Bible into categorical systems. This is useful because it gives you a way to learn about topics of the Bible that you and your children may have questions about. So for instance, we all have questions about the nature and character of God. Questions such as, “Who is God?” or “What is He like?” This book takes everything the Bible teaches us about who God is and what He is like and presents those truths in one, organized place. It does the same thing for other topics of the Bible such as Christ, sin, the law, and the Holy Spirit, to name a few. Systematic theology helps us make sense of and organize the beliefs of our Christian faith. A: Man’s chief end is to glorify God, and enjoy him forever. If this seems a wee bit “advanced” to you, let me assure you it is not. My youngest son was able to memorize the answers alongside his older brothers by the time he was 4 years old. A child’s ability to memorize and soak in information is absolutely amazing. Because my children were too young to complete the workbook portion of this book when we began studying it, I simply turned the Q and A’s into flashcards and they picked it up in no time. This is a fairly new resource that provides parents with an even easier method for catechizing their children. The questions and answers of this catechism are set to song and available for free on an app for your smart phone. It really doesn’t get much easier than that. 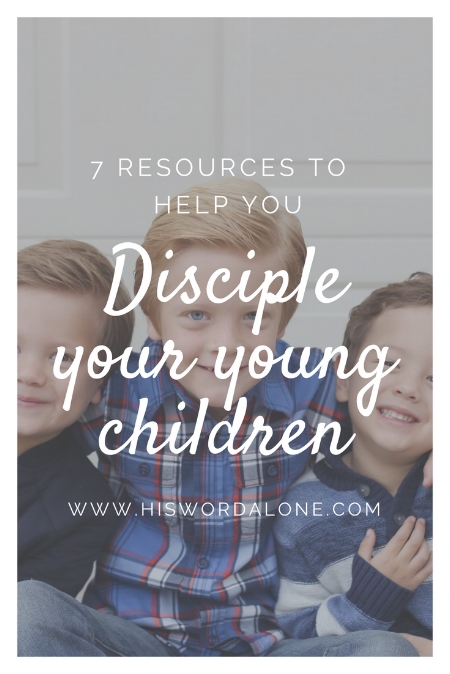 I happened across this resource at ABCJesuslovesme.com when my oldest was around 2 years old and have been using it ever since. Scripture memory cards are such an easy way to help your children hide God’s Word in their heart. I always have a hard time knowing which verses to pick out for my kids to memorize, so one of the things I love about this website is that it takes that burden off you. Simply find your child’s age, download the suggested memory verses, cut them out, glue them to index cards and voila! Especially when my kids were smaller, the picture alone was enough to trigger their memory of the verse. Keep them out on your kitchen counter and go over them at dinner or before bedtime each night. You will be amazed at how quickly your kids memorize Scripture. Ok! So, I know I’ve thrown a lot out there for you to consider. Don’t be overwhelmed! I would never do all of these things all at the same time. Depending on the age of your child, pick the resources that you think would be the most helpful at this stage of life. You don’t have to do it all, (nor should you try to), but you do have to consistently do something. If you have any questions or need further recommendations, leave a comment below! Need help studying your Bible? The second edition of my book, His Word Alone; A call to put down your Bible studies and pick up your Bible is now available. Order it today! HERE.